“Only a bunch of students and housewives.” With these words the Kremlin, in 1979, shrugged off mass protests in the West against Soviet repression of Jews. In fact the Soviet Jewry movement was a broadly championed human rights cause: led and supported by men and women from a variety of vocational and religious backgrounds; as well as by young people of high school and college age. This Soviet put down calls to mind, ironically, two groundbreaking actions early in the Soviet Jewry movement. The story of the first follows. The second story, "Freedom Caravan" which took place in 1971, appears later in my overall account. Only a bunch of students and housewives. Indeed? This story begins in April 1965, when a 24 year-old NASA engineer, Dan Goldin, volunteered to be youth coordinator for the Cleveland Council on Soviet Anti-Semitism (CCSA). Dan was a great fit for the job: a recent college graduate, a “rocket scientist,” boundless enthusiasm, and well informed on Soviet Jewry issues. In short order he organized a Youth Leader’s Workshop on Soviet Anti-Semitism on May 2, in the Workman’s Circle building. 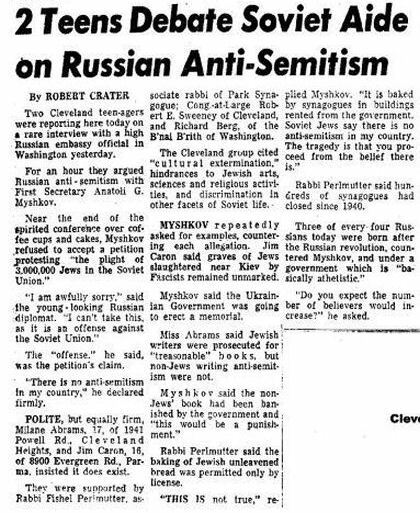 And a week later, in their first action, a delegation of Cleveland youth leaders presented a petition about Soviet anti-Semitism to the Moiseyev Russian dance troop, following the performance. That accomplishment, and others during the year, emboldened the young people to tackle a more ambitious project. 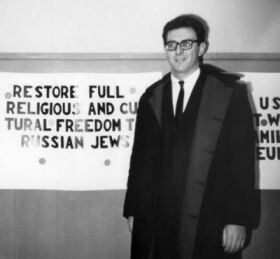 The new undertaking began at a Rally and March Against Soviet Anti-Semitism, April 3, 1966, sponsored by the Jewish Community Federation, the Jewish Community Center and the CCSA. During the event the young people held their own rally and prepared a petition to the Soviet Ambassador. 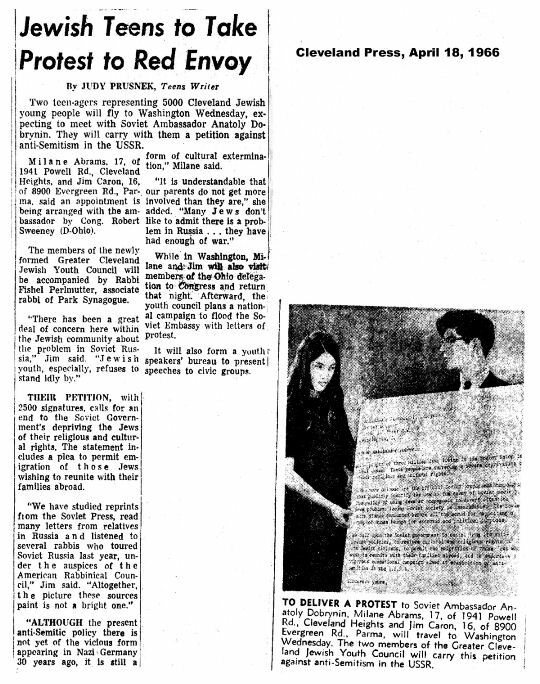 In the next two weeks they collected 2,500 signatures and selected two of their own, Jim Caron and Milane Abrams, to take the petition to the Soviet Embassy in Washington, D. C.
Above: Cleveland Press April 18, 1966 report of the protest. Jim and Milane flew to Washington, April 20th, accompanied by Rabbi Fishel Perlmutter of Park Synagogue. 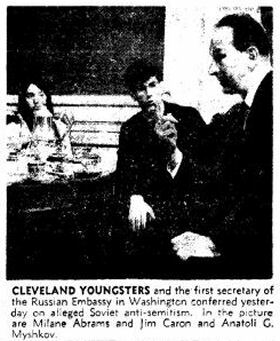 As pre-arranged, Congressman Robert Sweeney of Cleveland paved the way for a meeting with First Secretary Anatoli G. Myshkov of the Soviet Embassy. According to the press reports, our two high school students argued Soviet anti-Semitism with Myshkov for one hour. Not unexpectedly, the First Secretary denied even the possibility of discrimination against Jews and declined to accept the petition. U.S. officials later told Jim and Milane that this was the first time such a protest was allowed in the Soviet Embassy (and, as far as I know, the last time). These two young people conducted themselves superbly: well schooled in cases and points, they politely and confidently debated at length with a trained diplomat more than twice their age. 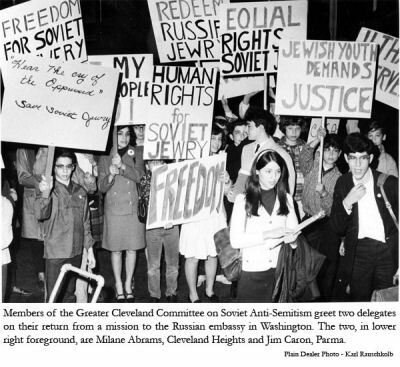 To cap the project, on returning to Cleveland, the two heroes were greeted at the airport by placard waving members of the newly form Greater Cleveland Youth Committee on Soviet Anti-Semitism and were later interviewed by the press. Wonder about the cost of the affair? A look through the CCSA Records turned up a 1966 invoice to the CCSA treasurer: Plane fare for youth delegation to Washington, D.C.; Rabbi Fishel Perlmutter, Milane Abrams, Jim Caron; United flights 622 & 637, April 20; $156; (signed) Daniel S. Goldin. Dan left Cleveland in 1967 to work for TRW Space and Technology Group in California. In the next 25 years he rose to be Vice-president and General Manager of the Group. On April 1992, President Bush chose him to be the ninth NASA Administrator. He served to November 2001. See Dan Goldin’s NASA accomplishments.